Right, so I'd like to talk about running. I'd like to talk about motivation, and determination, and just hauling off and signing up for a whole bunch of races (still haven't done it). I would even begrudgingly like to talk about my two hour and fifteen minute long run--err long trudge that covered barely ten miles on some hills and in unseasonably warm weather. However I can't. Not today. The reason? 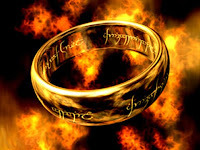 The One Ring. So a new physical phenomenon that I understood before, but now know painfully well, is this: Losing 50+ lbs + putting on copious amounts of sunscreen for a long run = me losing my wedding ring. ARRRRGHUGHNGHGHEAREAHGEGHE! This is very upsetting. Of course it happened as I was heading out the door for the long run. I sort of feel naked walking around without it. Since I acquired more skinny fingers, I developed this physical tick of reaching over with my thumb to make sure my ring is still on (its been falling off on a regular basis of late). Feeling nothing there results in a very strange, unsettled feeling. I have placed an internal, family bounty in the hopes this will motivate my six year old and four year old to find it, but no success yet. I know it is a material thing, and I shouldn't get hung up about it, but doggone if it doesn't have meaning to me! This ring does have a history of being lost and found before (you'll have to ask "teh wifey" about that funny story) so there is still hope. Until that time when I yell "Eureka" from the mountaintops, I'll just have to really live out this streak run thing, and "Run Naked". Wow! I can't believe you had the good fortune of losing it right on your property. I will look for it next time I am there. I am very good at finding things. Or I will bring a metal detector. I think airport security will like that. Oh and sigh, you are officially too skinny. There is always the benefit that once lost.. twill never be lost again. Well damn. If you lost THAT much weight, congratulations!! Is JoyRuN saying she hopes you find the weight you've lost? Wow, not cool, J.R.